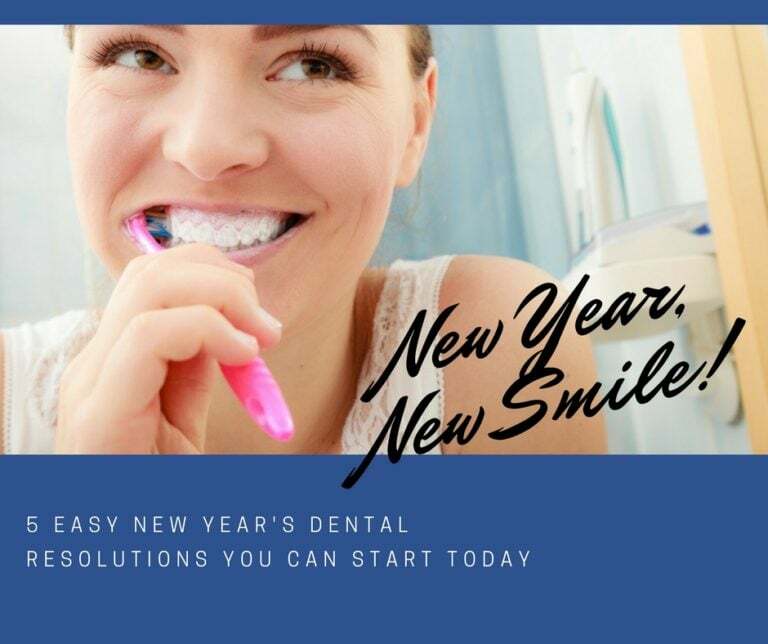 5 Easy New Year’s Dental Resolutions You Can Start Now ! The new year is a great time to set goals and change habits. While some people go “all in” with their goal setting and take on some major stuff, we’ve got five easy dental goals you can tackle without much effort. Think of your teeth like a car, they need periodic maintenance to keep them in working order. The average person should be seen by a dentist every 6 months for a cleaning and exam. Most insurances cover these appointments at 100% and for patients with no dental benefits, we offer a Dental Savings Plan that includes 2 free cleanings and exams per year and valuable discounts on our other services. One of the best things you can do to keep your mouth healthy at home is brush and floss. While most patients report brushing at least once a day, and flossing “on occasion”, for many there’s room for improvement. It is best to brush after every meal, to remove any food debris which can lead to cavities, gingivitis and/or bad breath. Brush for a total of 2 minutes, spending about 30 seconds on each quadrant of your mouth. Patients should also floss once a day. There is plenty of debate on whether you should brush in the morning or at night, but Dr. O thinks it really doesn’t matter, just as long as you get it done. Flossing is important because it reaches the areas you can’t get to with a brush. If you don’t floss away the food debris it also can lead to cavities, gingivitis and/or bad breath. If your gums bleed when your floss, this is a sign that you may have gingivitis or periodontitis and you should waste no time in getting in to a dental office. Your toothpaste needs time to sit on the teeth and “work its magic”. If you eat or drink right after brushing you will “wipe away” the toothpaste and cancel out its effects. After brushing, wait about 30 minutes to eat or drink, including water. While it’s best to avoid sugary substances altogether, it can be hard to live without a caramel latte or sweetened iced tea. One tip that can help keep teeth healthy when consuming sugary drinks is to drink the drink down quickly and then brush afterward. If you sip on sugary drinks throughout the day, your mouth is constantly bombarded by the sugar, which leads to cavities. If you are going to enjoy a sugary beverage slowly, drink it with a straw so that the sugar does not have a chance to sit in your mouth. There are times you may find yourself unable to brush after a meal. It’s a good idea to carry around sugar-free chewing gum for these occasions. By chewing the gum, you help remove any leftover food debris and kick up your saliva production, which washes away harmful cavity-causing bacteria. Take on these 5 Dental Resolutions and enjoy a happy and healthy 2018!